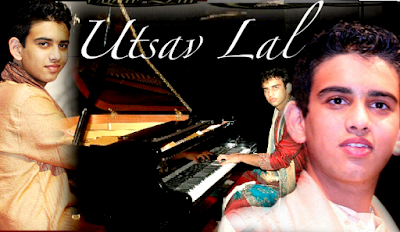 "Utsav Lal" The Young Piano Maestro!!. The INDIAN RAGA PIANIST"
Achievements: National Records Limca Book Of Records '07 Grade 8 Certificate, Trinity School of Music, London. Indian Prodigy Raga Pianist. Utsav Lal is one of India's youngest concert pianists. Oft referred to as a music child prodigy, born on 18th August, 1992, in New Delhi, India, Utsav’s passion for the piano began at the age of 7, when he learned to play nursery rhymes on the piano. With no formal training, in the initial years and no backing of a reputed musical heritage, it was an irrepressible enthusiasm and drive that prompted young Utsav to pursue his passion, strive to master the hugely challenging instrument and today be well known in India & Internationally as a Concert Pianist of repute. With the first time ever rendition of Ragas on Piano, Utsav has earned himself the title of "RAGA PIANIST" in music circles. A tribute to Raj Kapoor Ji. SOng "Jane Kahan gaye wo din" Superb performance!! National irish audiences on the talent hunt show-Class Act. Performing his original composition based on Raga Hamsdhwani. Having a head start on his musical sojourn today at a tender age, Utsav has achieved what many musicians spend a lifetime striving for. Plucking at keyboards of the piano he gave his debut solo concert for the International Cultural Centre Trust in Feb 2003. A spell bound audience listened incredulously. The journey from then has been one of a quick succession of performances with Utsav impressing the Delhi cultural circuit and there-onwards moving to showcase his expertise first across India with Indian melodies on the piano and then very soon moving onto the International arena with his unique piano playing style & original rendition of Ragas, creating a new genre of "Raga Piano Music. " As an established Indian Pianist of repute, Utsav has presented over 70piano concerts in India & abroad...at Delhi, Gurgaon, Jullundhar, Ludhiana, Kolkata, and Mumbai and at prestigious venues for Indian & International audiences in Dublin, Canada , Berlin & in London, Manchester, Wolverhamprton in UK . In the last year, Utsav has performed at The One World Music Evening, World Refugee Day, Festival of World Cultures '07 & '08 in Ireland , Asia Pacific week '07 in Berlin , National Concert Hall in Dublin, The Taj Festival in Manchester, Music Amongst Mosaic Concert series,RTE, Irish National television, India Habitat Centre at New Delhi, Bahaar Utsav by Surdhwani in Wolverhampton & a unique rednition of Ragas in a 19th century Church in Cork, Ireland. Many of Utsav's concerts have been to support various causes like Make-A Wish Foundation, Spastics Society, National Association for Blind, World Mercy Fund , Bridge Foundation Kolkata, Telethon people in Need, Rotary Club etc. The power of Indian music in the soulful sound of piano, a totally western music instrument is mesmerising. Utsav drew his inspiration at an early age from Indian Classical Music, and reveled in tickling the ivories to be one of the first Indian musicians to draw on the “Power of Ragas on the Piano”. Utsav is oft referred to as “ Raga Pianist”. 18th Sept 2008, Mumbai. Utsav Lal on Piano and Tabla wizard-Aditya Kalyanpur on tabla. Raga Yaman Kalyan. "Raga Madhuvanti" dedicated to Daniel Pearl World Music Days & the theme Harmony for Humanity. This is AWESOME!!! at India Habitat Centre, New Delhi in Nov 2007.Clip of Raga Hamsdhwani. Indian classical Piano Album "Piano Moods of Indian Ragas" by Times Music on Sept 18th,2008.Release by silver screen icon Shri Randhir Kapoor. Utsav’s creative expressions of the emotions & moods of Indian Classical Ragas have left spellbound audiences both in India & Internationally. Utsav has presented Ragas in his original & unique style of playing the Piano and some of his concerts have incorporated fascinating Jugalnbandi between the Violin & Piano or the Tabla / Mridangam & the Piano. Famed for his recreation of the magic of Indian Film music compositions on the Piano, many critics have reviewed him as a pianist, who makes the Piano sing ! Utsav can effectively transport you from the nostalgia of Mohd. Rafi,Hemant Kumar and Mukesh to the unparalled sweetness of Lata ji; take you down the oodling ages of Kishore Kumar to the superstar voice of Sonu Nigam and Abhijeet; the freshness of Shreya Ghoshal to the romantics of Adnan Sami. Covered extensively by Indian press and media, the young Pianist is a delight to watch, as he loses himself to his music, fingers follow the pace of the mind, with no scores in front of him, weaves magic with his fingers, slowly unfolding notes of the Raga, following it up with a rhythm accompaniment to present complex permutations & combinations of Raga notes & creates a mesmerizing musical experience! Tribute to the memorial erected by Maharajah of Gwalior,Shri Madha Rao Scindia for his personal physician-Dr Martin Alymers Croft at Church of Ascension, Timoleague, West Cork, ireland. Clip is excerpt from rendition of age old classic Piya Tose Naina Lage which is improvised based on Raga Khamaj. Utsav’s fans comprise of people from all age groups. Silver haired crowds that are mesmerized by the old favorites, teenagers drawn to the glamour of the piano, the corporate hi-flier who finds solace and enjoyment in going down the nostalgic memory lane, as well as the tiny boppers who love to dance to latest peppy numbers. A darling of the media as much for his piano expertise as his boyish good looking charm, Utsav has been extensively covered by Television channels like NDTV 24/7,Zee News,Channel7,Sahara NCR, Sahara Samay, DD Metro, DD News, IndiaTV, Total T.V etc. Accredited with fabulous reviews by the press for his concerts, Utsav has been written about by leading National & International dailies like Times of India, Hindustan Times, The Telegraph, The Hindu, The Kolkata Age, The Asian Age, Gurgaon Explorer, Today- the afternoon newspaper, Mid Day, Navbharat Times, and Rashtriya Sahara etc. Currently training under Padhraic O Cunneigain, reputed Irish Concert Pianist at DIT Conservatory of Music,Dublin, Utsav is also learning Jazz under Argentinian Pianist Germann Lema.Groomed as a professional pianist, under the aegis of noted Indian pianist, John Raphael (western classical pianist) Utsav underwent his early training on playing by ear, with the reputed Indian pianist Brian Silas. Utsav also owes his training and understanding of the nuances, depth and meaning of the phenomenal compositions of Indian Film music and recreating Indian melodies on the piano, to his guiding force-Jaideep Lakhtakia, a highly experienced musician who is a virtual encyclopedia on Indian film songs. Utsav's first steps into Indian classical Music were guided by Shri Vinod Shakiya, noted vocalist based in Jhansi,India & Late Shanti sharma Ji. Currently, Utsav is being mentored for Classical training by noted Violinist Sharat Chandra Srivastava & by well known Sitarist Gaurav Majumdar.Utsav holds all his teachers in great respect & credits them with being the inspiring and driving force behind his music passion.